All Bucky Bingo players who deposit £20 in the month of June will get the chance to win some fantastic prizes as part of the June Prize Drop event. First prize is a House of Fraser gift card worth £250 so you can treat yourself to a shopping spree on Bucky Bingo and have a rare day of guilt free shopping! Second Prize of £50 in Love 2 Shop Vouchers will be awarded to two players. Love 2 Shop vouchers are accepted by lots of High Street stores including Argos, HMV, Debenhams, Waterstones, River Island Boots, JJB Sports and many more. Third prize sees 10 lucky online bingo players awarded £15 cash so all in all, there are 13 prizes to be won. We’d be happy with any of these prizes and it could be you if you fund your account with £20 anytime in June. New members who join the very cool Bucky Bingo site will receive a 100% cash match deposit bonus on their first deposit up to a whopping £250! This gives you double your money to get you started and there’s a wide range of games for you to explore. 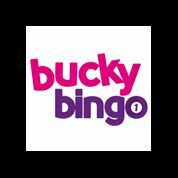 Bucky Bingo has 2 hours of free bingo every day except Friday when there’s an amazing 7 hours of free bingo games to keep you entertained so if you enjoy playing for a variety of prizes, getting great value for money and plenty of freebie games you know where to go!